In special reports, this week’s files cover: Earl Mountbatten’s and Royal Family Interest in UFOs, SpaceX taking two civilians to the Moon in 2018, A great man Joseph Stefula Passes, Fast Walkers, Sweden on the Brink?, and George w. Bush admits that there are secret ufo files, on Jimmy Kimmel’s Show. Unidentified Aerial Phenomena sightings were reported over Arizona, California, Florida, Georgia, Hawaii, Illinois, Kentucky, Minnesota, New Jersey, Pennsylvania, and Washington. Unidentified Aerial Phenomena sightings were reported over Argentina, Australia, Canada, Germany, Japan, Kazakhstan, Philippines, and England in the United Kingdom. During the Second World War, Admiral Lord Louis Mountbatten’s was Supreme Allied Commander, of South East Asia Command (1943–46).commander of all allied forces in South East Asia. UFOs were frequently reported in Northern India and China with a base in the Himalayan Mountains. He was the last Viceroy of India (1947) and the first Governor-General of independent India (1947–48). He was Commander of the Mediterranean Fleet in the early 50s and had personally seen UFOs up close. From 1954 until 1959 he was the First Sea Lord of the British Fleet the highest rank in the Royal Navy from 1954 until 1959. .Admiral and Earl Mountbatten’s biography states, “What do you think about flying saucers?“ He asked his daughter Patricia in a 1948 letter. He had been discussing the phenomena with his trusted close friend Peter Murphy. “They were both convinced that they come from another planet but we mutually and independently came to the conclusion that they were not aeroplanes with silly almost human pilots but are themselves the actual inhabitants: Martians, Venusians, Jupiterians or what have you. Why should life in another planet with entirely different conditions in any way resemble life on our planet? Their inhabitants might be ‘gaseous’ or circular or very large. The fact they can hover and accelerate from the Earth’s gravity and even resolve around a V2 Rocket in America (as reported by their head scientist) shows they are far ahead of us. If they really come over in a big way that may settle the capitalist communist war. If the human race wishes to survive they may have to band together.”Page 493 & 494 “Mountbatten” by Phillip Ziegler. Mountbatten shown here with President Kennedy was one of the three Supreme Allied Commanders of World War II (the others were Eisenhower and MacArthur) with a quarter million personnel under his direct command. Later he was the last Viceroy of India, who orchestrated its independence from England. Mountbatten had a keen interest in UFOs and likely discussed UFOs with the President. Lord Louis Mountbatten. Mountbatten’s interest in UFOs became public knowledge in the early 1950s. Indeed, through journalistic contacts, he encouraged public discussion of them, thinking that here was a new phenomenon which deserved to be taken seriously. When one of the workers on Mountbatten’s estate was late for work one day, he gave the excuse that he had seen a UFO in the sky and had stopped to watch it. Mountbatten questioned him enthusiastically. In 1955 Lord Mountbatten investigated a UFO incident in his own back yard, literally, that put his theory to the test. maintenance man at Broadlands, the Hampshire home of Mountbatten (shown). Briggs was either riding or wheeling his bicycle in the grounds, covered in a light dusting of snow, when he reportedly saw a large craft that looked like a child’s top hovering over a field. He saw a column descend from the middle of the object with what appeared to be a small (5’ 6”) fair haired, humanoid wearing overalls and a helmet. On reaching almost ground level the humanoid noticed Briggs observing his descent. The story was going to be printed by the Sunday Graphic newspaper but pulled at the last moment when the editor changed his mind so as not to embarrass the Mountbatten family. Desmond Leslie (shown) something strange happened to Briggs on the following day. Briggs was cycling to work up the same road to Broadlands when he encountered the blue uniformed humanoid, standing in the middle of the road, ahead of him. He stopped, shook the hand of the humanoid, who winced and explained, telepathically, that his race was not as strong as humans. A rather bizarre statement when had they really wanted to contact the Earl they almost certainly could have done. It is odd that Mountbatten never admitted to seeing this craft or the humanoid(s) Briggs encountered on his grounds. Subsequently when Mountbatten was later told this second tale via a letter from Desmond to the Queen’s Private Secretary he dismissed it all as nonsense. Thanks to Flying Saucer Review V26 No. 5. Lord Mountbatten was assassinated by an IRA boat bomb while fishing off the coast. Prince Philip is the Queen’s long term husband who is respected for his long public service in both war and peace time. Prince Philip also harbors a keen interest in the UFO phenomenon. While living in England I had the privilege of dining in with Prince Phillip, His Royal Highness and Duke of Edinburgh at Sculthorpe RAF Base. He told four of us officers about his keen interest in UFOs and that some of his relatives had seen them. He reiterated what he stated much earlier in the press, “There are many reasons to believe that they (UFOs) do exist. There is so much evidence from reliable witnesses.” Sunday Dispatch, London. March 28, 1954. He was promoted to Admiral of the Fleet on 15th January 1953. His other British service appointments are Field Marshal of the Army and Marshal of the Royal Air Force. Prince Philip achieved 5,986 hours in 59 types of aircraft. He was interested in our sightings over England. He told me that, Admiral Earl ‘Dickie” Mountbatten, his uncle who raised him, who was at sea as the Fourth Sea Lord, and was Commander of the Mediterranean Fleet in the 50s had personally seen one.” Prince Phillip assured me he and his Uncle had strong interest in UFOs. Frankly he convinced me UFOs were real and a possible threat. On Monday, November 30, 1981 ITN news broadcast a story that the Duke of Edinburgh was piloting a light aircraft 3 days earlier. The plane was involved in a near miss with a Boeing 747 taking evasive action to avoid colliding with a UFO. The Times reported the incident the following day in a somewhat serious tone. “Buckingham Palace confirmed last night that the Duke of Edinburgh was at the controls of an Andover of the Queen’s Flight when it was involved in a near miss with a jumbo jet carrying 200 passengers to Miami. The incident happened after a British Airways Boeing 747 had taken off from Heathrow airport on Friday and was climbing at 300 mph, according to reports. Nick Pope the former Civil Servant in charge of the UFO desk for the MoD has confirmed that the Duke of Edinburgh kept a map at Buckingham Palace with the locations of UFO sightings on his wall. The Duke even asked the British Air Ministry to send him a copy of their UFO reports. He also encouraged his equerry (Senior Attendant), Sir Peter Horsley, to discreetly study UFO cases and to bring UFO witnesses to the Palace for private discussions. Sir Peter Horsley was a former World War II pilot and squadron leader. He entered the service of the Royals in July 1949 before returning to the RAF in 1956 where he rose through the ranks. His final role in the RAF was as Deputy Commander-in-Chief RAF Strike Command in 1973 before he retired. The conversation started with Janus asking Horsley about everything he knew about flying saucers. Janus explained that man was going through a Dark Age. Humanity was using technology like a child with new toys giving scant regard to his surroundings, nature and his fellow humans. He explained that in 20 or 30 years (remember this was 1954) that rockets and satellites would become commonplace and miniaturization of our technology and advances in communication would grow rapidly. However he stressed that Earth was in a backwater of the galaxy, inhabited by half civilized beings who posed a danger to their neighbors. Earth was visited from time to time but mainly by robot controlled probes. Occasional “physical” interference was necessary but a general rule of space exploration applied throughout the galaxy. “..Do not interfere with the natural development and order of life in the universe”. “I would like to meet the Duke of Edinburgh….a man of great vision, who believes strongly in the proper relationship between man and nature which will prove of great importance in future galactic harmony”. Horsley made a full verbatim report of his meeting. He was disturbed by the fact that Janus could seemingly read his mind and had a significant knowledge of nuclear installations in Britain. Michael Parker, Prince Philip’s private secretary, treated the report as a joke but commented that the Duke of Edinburgh had actually kept an open mind to the whole affair. Thanks to http://www.abovetopsecret.com and Sounds from another Room. Jimmy McCloskey reports Prince Charles, 66, and his dad Prince Philip, 93, allegedly had Flying Saucer Review posted in unmarked envelopes after Lord Mountbatten saw the interstellar craft. The astonishing claim was made by retired doctor-turned-UFO expert Steven Greer. Dr Greer also said he helped supply Charles with documents on alien encounters at the London premiere of Star Trek film First Contact in 1996. The former A&E medic told the Daily Star: “The late publisher, who was former British Intelligence, Gordon Creighton, told me personally that the royal family received it on a regular basis. 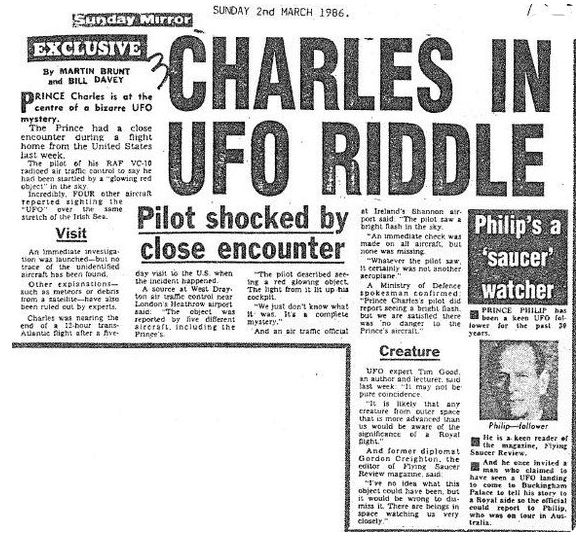 Martin Brunt claimed that Prince Charles had a close encounter with a UFO, whilst returning from the USA in his RAF VC 10 aircraft on 23 February1986. His pilot reported a bright red flash that lit up the cockpit, as it did to four other planes then over the Irish Sea. Many hundreds of people in Ireland, and Wales saw it too. One of these was UFO investigator Jules Johnson in Belfast, who reported it to Armagh Observatory. It was a bright red ball of fire with a tail that streaked across the sky in a couple of seconds. He had no doubt what he had seen – until he read the Mirror! All you budding investigators out there tell me what a bright object with a tail streaking across the sky and clearly miles high in the atmosphere (because it was seen over such a wide area) what might it possibly be? Answers it was likely a fire ball meteor. Just prior to the royal wedding of Prince William and Kate Middleton I predicted UFOs will likely be seen over London as it’s common to see UFOs around important events, and it’s highly possible they may also be watching the royal wedding. In fact there were suspicious craft in the sky during the wedding taken from World War II aircraft flying above the festivities, but nothing I could prove. The cameras were all on the newlyweds. A TOURIST filmed a UFO hovering over Westminster Abbey — the venue for tomorrow’s Royal Wedding. The 2½-minute video footage shows a shimmering white object in a cloudless blue sky near Big Ben. https://www.thesun.co.uk/archives/news/510004/wedding-et-spying-on-abbey. LONDON – The videos of the Royal Wedding from multiple television coverage shows several possible UFOs over London on April 29, 2011. A cylinder shaped object is seen flying over the city not far from Westminster Abbey and could be an alien reconnaissance vehicle. As the wedding couple drive past the entrance to Buckingham Palace many in the crowd are looking at the sky rather than at the carriage at this apparent cylinder picked up on Fox News. It’s been a long time since humans orbited the moon — but Elon Musk’s SpaceX is going to try and change that next year. The company just announced that two private citizens approached SpaceX about a trip to the moon for late 2018. The two potential space travelers have already paid a “significant” deposit and SpaceX expects health and fitness tests along with initial training to take place this year. SpaceX also says that other flight teams are interested in similar trips — if this first voyage works, we could see a whole sequence of trips around the moon in the near future. SpaceX was careful to note that there’s no moon landing being attempted here. But still, this will be the first time in 45 years humans return to deep space, and the company says that these travelers will go further into the solar system than any humans have before. CNBC reports that the trip will take about a week. SpaceX CEO Elon Musk says that the trip will “skim the surface of the moon, go quite a bit further out into deep space,” and then return to earth. Joseph J Stefula , age 71 passed away on March 2, 2017. He was a great friend of mine. He was awarded the Silver Star Medal in Vietnam for gallantry and Purple Heart in defending an outpost from over whelming Communist attacks. He preceded me as New Jersey State Director of the Mutual Ufo Network Inc. He retired from the US Army has a Warrant Officer and had served in the U.S. Army Criminal Investigations Command, He used his investigative skills to search out excellent UFO cases and discovered that the military was tracking Fast Walkers (UFOs) entering leaving our atmosphere providing strong evidence of the reality of the phenomenon.. He was a very generous person with his time and resources. He was a Disabled veteran who served his nation in time of war and peace. He was a close friend of the late Remote Viewer Ingo Swan. He died after his battle with chronic illness and an operation on his back. He is survived by his lovely wife Evelyn and children. Joe will be missed by many of us forever. UFO Researcher Joe Stefula’s Revelations on Fast Walkers. MAY 5, 1984, an alert was triggered at the North America Air Defense Command. Moving at 22,000 miles per hour, an object was heading toward Earth and had been determined to NOT be incoming ballistic missiles, or any other type of conventionally explainable object. Once tracked, it was code-named “Fast Walker”. ite depiction of reversal of course by “Fast Walker” as it headed back toward open space. At 1400 hours Zulu time, an object was spotted by a USDSP satellite and tracked as it sped first directly toward the Earth and passed in front and within 15 miles of the USDSP satellite. It suddenly and without impact or contact with other devices or obstructions curved outward, away from the Earth. It was tracked for another 9 minutes until it then disappeared. What the data resolved was that it was a hot, fast, solid object that swept in from outer space. This information would probably have been totally kept from public view, but it was leaked to UFO Researcher Joe Stefula. If the Fast Walker had been a meteorite, it would have burned up in the Earth’s atmosphere. The fact that it changed trajectory so dramatically when it was headed directly toward the Earth at such a high speed, indicates emphatically that it was not a natural phenomenon. No natural object could’ve overcome the gravitational force of the Earth, especially when its speed and trajectory would compound the effect of the Earth’s gravitational pull. To have reversed course so drastically with these natural forces in place is truly astounding. Only intelligently controlled objects would be capable of such a maneuver proving the existence of UFOs. Thanks to Dave Kauble. SWEDEN is on the brink of becoming a lawless state as the police force is losing the battle against unprecedented levels of crime and violence amid a growing migrant crisis. Women are afraid to go out. On average three police officers are handing in their resignations a day. If the alarming trend continues, more than 1,000 officers will have quit the service by year end. Since the migrant crisis began last summer, Sweden has been hit by a series of brutal crimes and violent incidents. The police force has reached breaching point as more than a million crimes were reported in 2016 over the previous year. Phoenix — We noticed that a helicopter was circling the area in a rather high speed on February25, 2017. Powey – I went outside to check and see what was above my room that at first looked like a glowing boomerang shape or parachute with no person attached on July 11, 2011. I went back to grab the camera, and the object changed direction and ascended to 10,000 feet above ground. Homestead — This happened on February 25, 2016. Multiple reports suggest it was witnesed by a large number of people. I am an aircraft mechanic and I can’t explain this video with my years in aviation. Newnan – The first time I noticed it I was teaching my daughter about constellations in the front yard. We decided to get in the car on February 21, 2017. We took many photos that day…this was the only one where the object appeared. Oakland — I live in a semi rural area and my dog would not go out, so I went out with her on February 10, 2017. We were in the front yard, and I soon discovered why she didn’t want to be there. I had my cell phone in my coat pocket, so I pulled it out. I felt movement all around me, but didn’t see anything. I began taking pictures where I felt there was something moving. Also took a few short videos. Later when I went back in and looked through the pictures…I was shocked. Still not sure what this small blue light was, but I’m going to submit 3 more instances with pictures of things that I cannot explain…since this first date. The last two for sure were saucer like UFO’s. Old Tappan — I was walking my dog and saw red lights and rapid movements I immediately knew it was a UFO it was moving fast and slow. Photo captured on February 19, 2017. We were walking back from a park on March 1, 2017, and I turned around and saw it and we freaked out and started filming. I thought it was a UFO right away. When we all looked at it turned away. I think it was watching us. cell phone. In one of the pictures watching in details, I saw this object, flying in the sky. I didn´t see it in the moment that I took the picture. I saw them in my computer and using zoom and other effects on the picture. I sent the original picture with the object and the zoom in another picture. Hobart — We were on vacation to Tasmania, Australia, when my aunt decided to take a photo at dawn on February 27, 2017. We only noticed the object in the picture near the place we were staying at after the fact, so cannot say it was witnessed in person. Oshawa, Ontario – On Monday, February 20, 2017 while outside my home I noticed a very high flying white unknown object moving across the sky from west to east. Being camera ready I took thirteen pictures capturing it on four pictures at 10:58 to 10:59 am. Lac St-Paul –In 1973, a group of people were having lunch one afternoon near Ferme-Neuve, Quebec and took 7 pictures of this UFO. I don’t have them anymore but I remember that one could see that the object tilted at times in the air while hovering. All I have is a magnified version of the best picture which I kept over the years. Oostende, Belgium — I was flying from London to Helsinki at night in a Finnair plane. Then I saw three bright lights. First I thought they were stars. But then I noticed that the lights outlined a black triangle. The triangle hovered and went in different directions. Then the lights went out and I couldn’t see the triangle anymore. The rest of the flight was normal. I saw a pulsating white blue light right over the rooftops of my neighborhood on February 24, 2017. I’ve never seen anything like it. No chopper, no known aircraft or military aircraft, I can assure that. It was way to close and too big to be a star, unless stars move underneath clouds now. I tried to film the sky too, to show the cloud covered black night. An aircraft flew in the direction of the object. You can see the tremendous size and brightness difference. The object was there for over three hours. Every time I filmed it longer than two minutes my phone gave me a warning of an unknown error and deleted the video. As I turned off mobile data connection and Wi-Fi, it had no issues anymore. I was in the window seat on the JR Train travelling north from Kyoto station to Takayama, on a clear day over a running river. I was photographing contrails above the train and was distracted by unusual activity in sky. Two photographs were taken with an I-Phone 6 Plus. The object flew along the river. It was green and brighter than all surrounding surfaces. I had no reactions until 20 seconds later viewing the last two photos. I had no initial visual contact with orb and lost sight of object due to rapid movement in opposite directions. Astana — A witness sent a photo analysis of a flying disk taken on July 5, 2016. The witness did not say anything about what was seen and included no detail. The witness was contacted for more detail, but no response has been received. The witness sent several photos and an animation of analyzed photos.